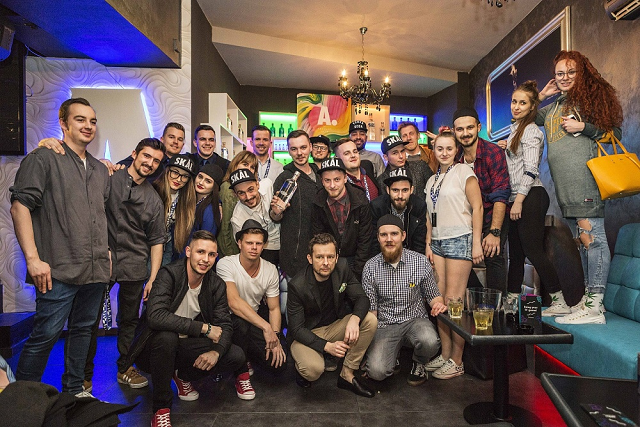 At the end of March 2017 ten bartender teams each made up of 2 members from various bars and clubs from all over Slovakia gathered to be assessed by the grand jury of the Slovak round of the bartender competition ABSOLUT INVITE The Team Edition 2017 represented by jurors such as Rico Dynan (Global Brand Ambassador of Absolut Vodka), Zuzana Benková (Brand Manager Absolut Slovensko) and Luboš Rácz (Special consultant at Pernod Ricard, Barkultur). What Absolut Invite Team Edition separates mostly from the rest is the fact that bartenders don’t compete individually but rather in a team of two which definitely adds an extra boost, creates an awesome atmosphere and enables contestants to show whether they’ve got what it really takes to win in a truly tight and impressive competition. Last but not least, it excels with a plethora of various disciplines which are meant to test a wide array of bartending skills. This year The Masquerade Club in Bratislava hosted the event perfectly suiting it with its experience under its belt. The teams’ knowledge and experience have been put to the test in various, well-conceived rounds – the competition was kicked off with a quiz on the history of Absolut vodka and drinks, a special part dedicated to sensing focused on the mixing of a myriad of well-known cocktails, the precision they were made with and their consistency. A joint team effort on the other hand to assemble a shelf by the Swedish furniture manufacturer IKEA within the physical capabilities part gave the jury an idea of how fast bartenders can think, work in a reverse mode and cooperate with each other. The creative part of the competition did not lag behind for long where the creative and presentational skills of mixing one’s own original recipe using a spirit form the Absolut portfolio were put to the test. The jury closely watched each team’s presentation, visual appeal of the end result and obviously the smell and taste of any given cocktail. The competition turned out to be extremely exciting keeping everyone in suspense with even results till the very end. “The competition all day and night long was awesome. I am absolutely confident that everybody enjoyed it and we are all leaving with great memories,” added Karol Domisch by Pernod Ricard Slovakia, the company being in charge of organizing the competition. The absolute winner has justly become the bartender team from the hosting Masquerade Club Kamil Antálek and Marek Janíček who hit the ground running with extreme speed in the physical capabilities and “on the clock” part, they’ve got a knack for cocktails for sure. Their drink was surprisingly simple and fresh. They definitely deserve the first prize and the attendance of the worldwide finale taking place in Sweden in June 2017 not only with the skills they have but also with a good command of English and tireless team presentation. The second place goes to the bartender team Ján Babiak a Filip Schultz from Záhir Café who also managed to win the audience award granting them the first place in the VOX POPULI competition assessed by the guests present at the bar at the time. So 100 liters of Absolut vodka and the free ticket to the training Akademi Pro in Sweden go to the team in Nitra. Way to go! „We are absolutely excited to have competed against our colleagues from other bars in an effort to compare the quality of our service. It was really worth it and the results unbelievably even. Even though we went in confident, the end result totally caught us off guard. It’s just yet another proof, though that a good bartender must master all walks of their profession, some of it only are not going to cut it since the world finale is not going to show us any less mercy. Nobody proves better that it was a friendly competition than the guys from Záhir who were generous enough to share the 100 liters of vodka with the first three winners as well as the barback who bent over backwards to provide a solid background all day long. Words do not cut it how thankful to them everyone is right now,” the winners shared their opinion. 17 winning teams from all around the world, who apart from attending the Absolut Invite Team Edition global finale and all its demanding disciplines, will have the chance to experience a road trip to the very birthplace of Absolut vodka, the town of Ahus and a plethora of other unforgettable moments in the four days of the competition.